It was in August of last year that the full horror of the war in Syria went viral, the attention of the entire world captured by a single profoundly disturbing image: that of a 5-year-old boy, Omran Daqneesh, seated calmly in the back of an ambulance, face caked with blood and dust after the destruction of his home. As many were quick to point out, such heartbreaking collateral damage is an all-too-common sight for those actually living in the most ravaged areas of Syria. It’s the kind of thing, in fact, that the subjects of Last Men In Aleppo see nearly every day. 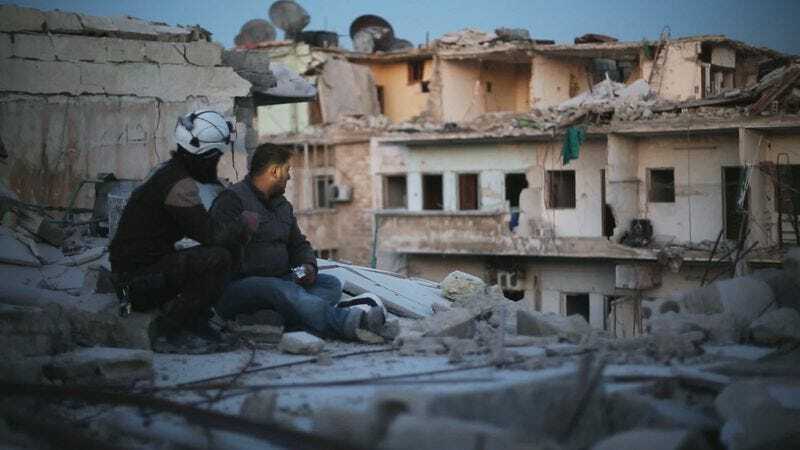 Firas Fayyad’s grueling, gripping documentary shines a spotlight on the Syria Civil Defence, a.k.a. The White Helmets, a network of civilian first responders who rush to the site of recent airstrikes, putting their own safety at risk to pull fellow citizens from the rubble. If Omran Daqneesh, one injured child in a city full of them, has become the international face of Syria’s trauma, perhaps the White Helmets are the living embodiment of the country’s courage and perseverance. Their sacrifice is a beacon, bright as the bursts of yellow destruction dancing across the city’s skyline and drawing them back into the fold. Last Men In Aleppo wasn’t conceived as a monument, even if does ultimately stand as one. Nor does it attempt to provide a history of the SCD, which grew out of unconnected neighborhood rescue efforts in the areas most affected by the fighting between Bashar Al-Assad’s forces and the Free Syrian Army. Instead, Fayyad offers something close to a war correspondent’s portrait of the White Helmet operations, documenting what feels like a few weeks in the dangerous lives of these frontline volunteers. We follow them repeatedly into the fray, charging into areas others are fleeing, digging through the debris of destroyed buildings in search of survivors. They’re not for the faint of heart, these shocking snapshots of emergency response; more than once does the film depict someone reaching into piles of stone to retrieve the lifeless body of an infant. Last Men In Aleppo spends downtime with its subjects, too, capturing them horsing around with a soccer ball or heading off to a wedding. But the calm between storms is inevitably short-lived—a helicopter in the sky cutting a family picnic short, the crackle of a radio telling these tireless good samaritans that duty once again calls. They’re heroes, inarguably. They have the steel nerves and cool heads of seasoned paramedics (“That’s a woman’s leg,” one of them calmly remarks while combing through the aftermath of an especially devastating attack), and they seem to perform their brave public service without a trace of vainglorious self-regard—at least based on the footage presented, including a moment when volunteers go to check up on one of the children they’ve rescued, only to leave feeling a little ashamed of the awed admiration their visit provoked. Fayyad, who knows plenty about sacrificing for his country (he was imprisoned and tortured for documenting the civil uprising before the war), is certainly expressing his own awed admiration for the White Helmets. But as a journalist and a filmmaker, he’s also in search of a good story, and Last Men In Aleppo tries to find it not just in acts of heroism, but in the quick glimpses of anxiety Fayyad catches, as his subjects slump against a wall or give in to despair when afforded a respite, the time necessary to really process what’s happening around them. Individual personalities emerge, none more magnetic than Khaled Omar Harrah, who gained international recognition in 2014 for the rescue of a 10-day-old baby. Unofficial morale booster of his unit, the burly, gregarious Harrah cracks jokes to lighten the mood; “Let’s go overthrow the regime at my place,” he quips during one protest. But this born leader also struggles to reconcile fear for his family’s safety with a refusal to abandon his city—a conflict that Fayyad mirrors, somewhat heavy-handedly, through scenes of his subject attempting to build an artificial pond in the wreckage, hoping that the fish can somehow survive the inhospitable environment. (To be fair, it’s Harrah who hammers the metaphor home: “I’m just like the fish. I can’t live outside of water.”) Headlines have already told the tragic end of Harrah’s story, just one week before the footage of Daqneesh spread across the globe. But that doesn’t make it less wounding to see the movie get there itself, with apropos abruptness. 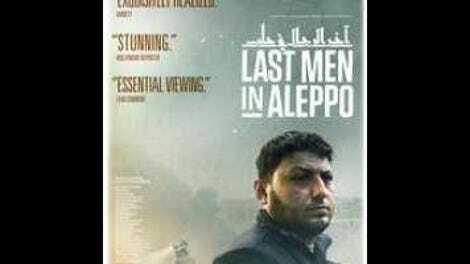 Winner of the Grand Jury Documentary Prize at this year’s Sundance Film Festival, Last Men In Aleppo has the upsetting urgency of breaking news: There are moments that could have come straight from a live stream, given the violence that’s still rocking Syria, months after Fayyad’s cameras stopped rolling. Not that the footage will somehow lose its power in the weeks, months, or years to come; it’ll always be stirring and harrowing, seeing these everyday relief workers put their own lives on the line, day after day, to find those buried under the remains of fallen buildings or trapped in burning cars. But if Fayyad’s aims are more humanistic than polemical, honoring the people-first neutrality of the White Helmets themselves, it’s hard to walk out of Last Men In Aleppo without a renewed outrage toward those who would deny innocents like Omran Daqneesh safe haven. “Where can I send them?” Harrah eventually asks, when encouraged by a fellow SCD member to get his kids far away from the smoldering war zone of Aleppo. The question goes damnably unanswered.